I’m supporting the Colorado flood relief efforts of Foothills United Way. Foothills United Way has established the ‘Foothills Flood Relief Fund’ in response to the impact of the severe flooding across Colorado’s Front Range. The funds raised through this effort will be used toward health and human services for those affected by the flooding in Boulder and Broomfield counties. Help me raise $10,000 for Foothills United Way on my Crowdrise page. Donate $27 or more and you’ll be entered into a monthly raffle to win a Marmot tent! Confidence is like a bonsai tree. It’s delicate branches take ages to grow, but when put in the wrong hands, those wisps of life won’t last long. Too much water, dead. Calling take on your warmup, confidence destroyed. Over the last few months, I’ve watched my confidence rise and fall like Genghis Khan (yes, I’m working on my Asian similes). This summer in South Africa, I climbed on fun, physical, new-to-me routes almost every day. My confidence rose as I found myself gaining fitness and the will to try hard. In Russia, I ate fried potatoes for a month and fell off my project more times than I could count. That month was followed by two months of rain in Italy and Japan. My fitness declined, wrestling my confidence into the dirt without so much as a struggle. 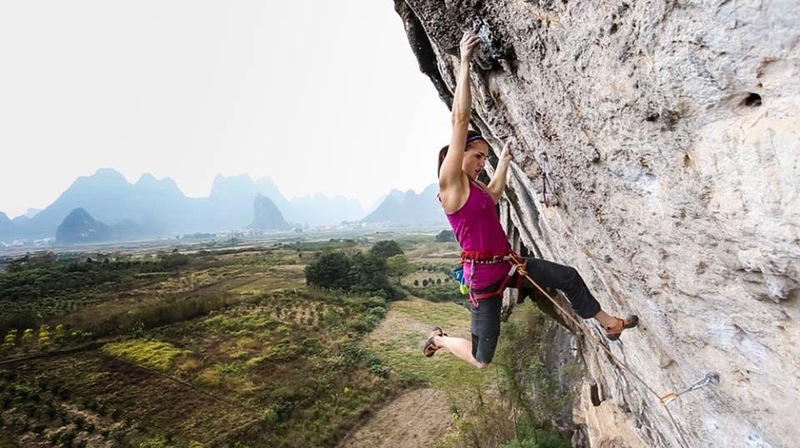 I found myself in Yangshuo, China on some of the world’s steepest, most physical climbs with atrophied forearms and the core strength of a hippopotamus. On day one, I called take on my 5.11 warmup. I was scared of the one foot runout, weary of the stalactite protruding 2 inches from the wall that I would unarguably hit on the way down, and I was pumped. The incident was laughable. However, it stood as a testament to the reality that even after fourteen years of climbing, I have to choose every day whether I will be afraid, whether I will try hard, whether I will allow myself to reach the top. My muscles, my tendons, and my technique will all work together. But will my mind comply? My answer to that question determines the outcome of every day. After a rough introduction to Yangshuo, I knew I would need to try really, really hard if I wanted to accomplish anything here. In this fairytale land where stalactites and tufas coat the walls like your over salted Thanksgiving stuffing, I wanted to accomplish something. So I set to work. 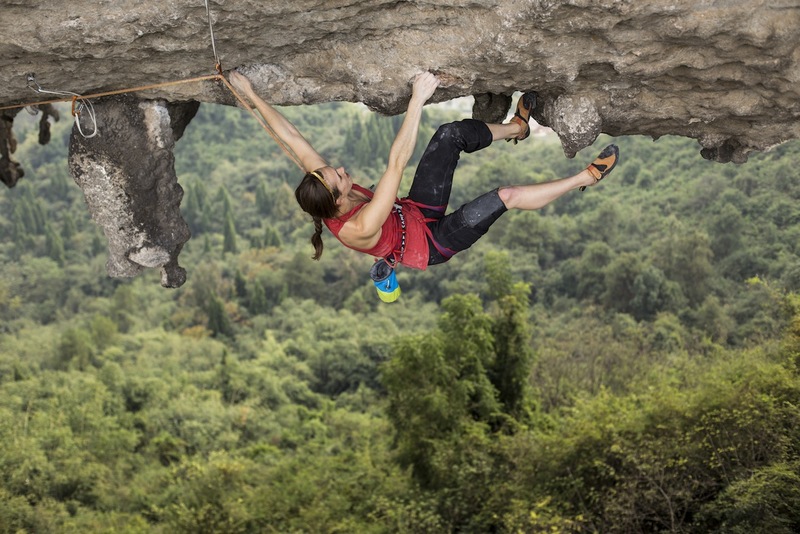 I told myself to stop saying take, and instead spent four days whipping off 5.12s and 5.13s. Check, I felt comfortable falling again. I chose a few routes with slippery smears. Check, I could trust my feet again. In this manner of testing myself in situations I knew I should be comfortable, I reassembled the mindset I needed to climb hard. With my confidence somewhat more in tact than when I arrived, I set to work on a few projects. Within a few days, I finished China Climb at White Mountain, a sustained 5.14b/8c with big reaches on underclings, a razor crimp crux, and a pumpy exit on tufas. Fortunately, you can throw in a no hands kneebar to clip the chains – saved! Sea of Tranquility (5.14a/8b+), Moon Hill’s hardest existing route was next on my list. Climbing out a completely horizontal roof is about as opposite my preferred style as it gets, but I couldn’t pass up the opportunity to climb a feature so unique. I spent a few hours hanging my draws on what is probably the longest pitch I’ve ever climbed. Surfing through the arch is a committing endeavor, since you can’t really stop to clip, let alone hang long slings, through the crux section. After a pretty serious amount of effort, I got the draws on and lowered to the ground, more tired than I think I’ve ever been from climbing. I pulled on more draws than holds through the final headwall, so I didn’t have much of an idea what the last five bolts of climbing looked like. On my next attempt, I pumped out 9 bolts into the 5.11 intro section…with only 13 more bolts to get to the chains. Yesterday, I ventured out onto the roof in hopes of sorting out the top moves. The wind was absolutely insane, which made the roof feel even more insecure and the long draws nearly impossible to clip. I fumbled through clipping all the draws I would have skipped on a redpoint burn. Once you fall off the arch, it’s nearly impossible to get back on. Somehow, I found myself climbing through the crux and onto the no-hands-stalactite-mount-rest. 6 more bolts of climbing would present a short crimp crux and then…I had no idea what. I took a deep breath, left the rest, and put my best “onsight” skills to the test (not an actual onsight, it just felt like one). I clipped the chains, relieved to not have to climb through that roof again. Until I realized I would have to top rope the entire route to clean my draws. That’s today’s objective. I think it helped to have my favorite brother belaying me. I didn’t find either Sea of Tranquility or China Climb hard for the grade. Traditionally, I find myself finishing routes of this grade a few tries later than I would like, but I think the name of the game in Yangshuo is endurance. That said, there are certainly routes with some pretty serious moves, and it’s been fun to watch all the locals climb on the area test pieces. Our friend Duke just climbed Spicy Noodle (5.14b/8c) after only climbing for two years! 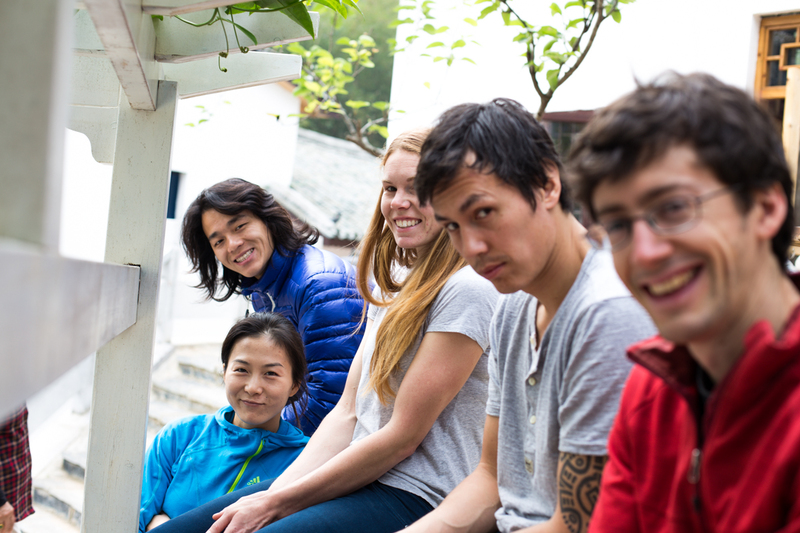 Abond and Ting are the powerhouse couple of Yangshuo, and it’s been so fun to climb with these guys. 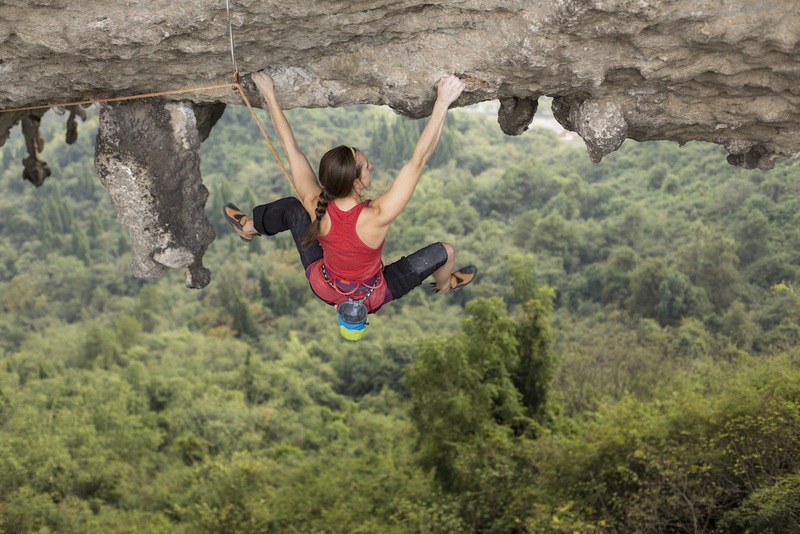 They have unlimited positive energy and climbing styles that I know I can learn from. 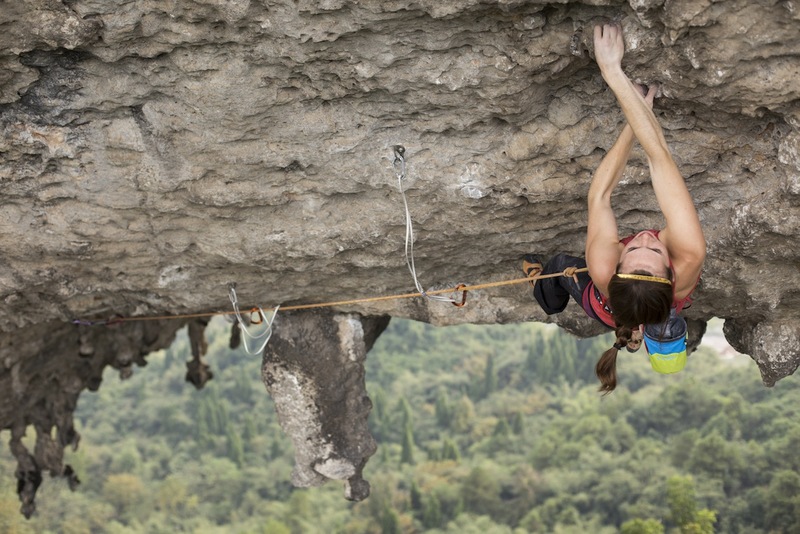 One more week to learn, train, and try to nail down a few more routes! 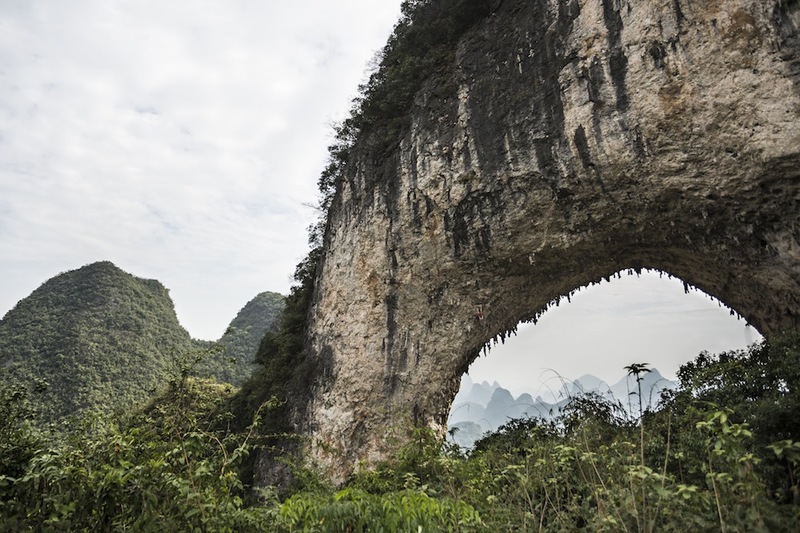 I’m excited that I’ve been able to put my time in Yangshuo to use, not only in finishing a few beautiful classics (I think every route here is classic), but in regaining both my fitness and confidence. I hope it sticks around for a while, but who knows. I’ve killed a bonsai once before, it could happen again. Great pictures, even better insight. You get a lot of respect from me, not that it’s worth much, for the mindset you brought to climbing that horizontal roof. I hope that your confidence bonsai is a Norway Spruce. Climb on! So awesome to see you in a knee pad crushing overhanging routes, Paige! Awesome pictures and really great writing, once again 🙂 Miss you! YEAH PAIGE!! PSyched you’ve found your groove again. Onto the next adventure!! !